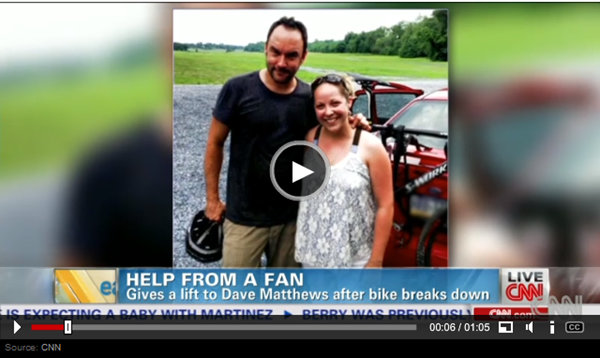 Musician Dave Matthews was out for a bike ride on Saturday shortly before his concert in Hershey Pennsylvania, when his back tire popped, leaving him stranded on the side of the road without a cell phone. 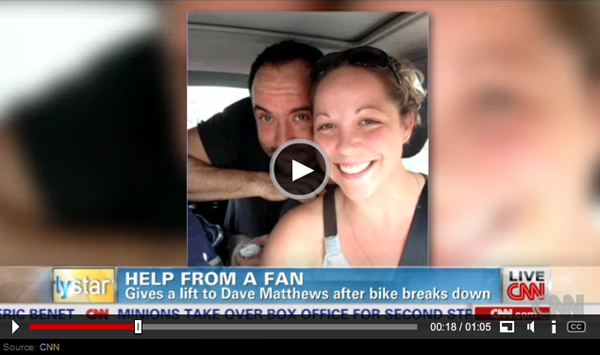 Emily Kraus had been a Dave Matthews fan since she was 9 years old and was on her way to his concert when she encountered a man stranded on the side of the road. Kraus was shocked to find out it was Matthews’ himself, and gave him a lift to his own concert. Lovely to see that Matthews was out for a cruise in regular clothes – clearing his mind before performing in front of tens of thousands of fans. Though I have to wonder if she would have stopped to pick him up if he didn’t look “very familiar”. Either way, this is a wonderful story and a nice coincidence that she had a bike rack in her car too.